The company that makes the jack kit has a phenomenal amount of processes going on in-house. They stamp the raw metal that makes up the kit components, coat/paint all the components, machine threads and other areas of the jack, robotically assemble the kits of different configuration, print the labels and ship these to a multitude of automotive people for a large assortment of vehicles (these are all pretty much vehicle-specific kits). Even the labels are in different languages because certain models are being exported to different countries. Every detail is important in this little kit that could potentially bail a person out of a bad situation, yet may never be used in the lifetime of the vehicle. Kind of an “Unsung Hero” component! 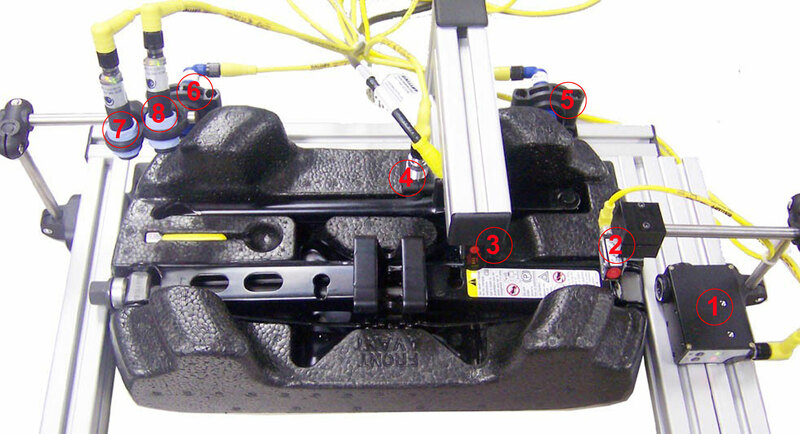 In the picture below of the assembled car jack kit, how many error proofing sensors do you see checking for completeness of the jack kit? If you answered eight (8) you’re correct! The black box you see on the extreme right is a luminescence sensor that is sensing the “glow” given off by the ultraviolet properties in the grease (many grease products naturally have luminescent properties), so we’re sure that the shaft threads were lubricated. Above and to the immediate left of the UV sensor is a small block style diffuse reflective sensor with BGS (Background Suppression) properties that validates the presence and location of the safety label on the jack. 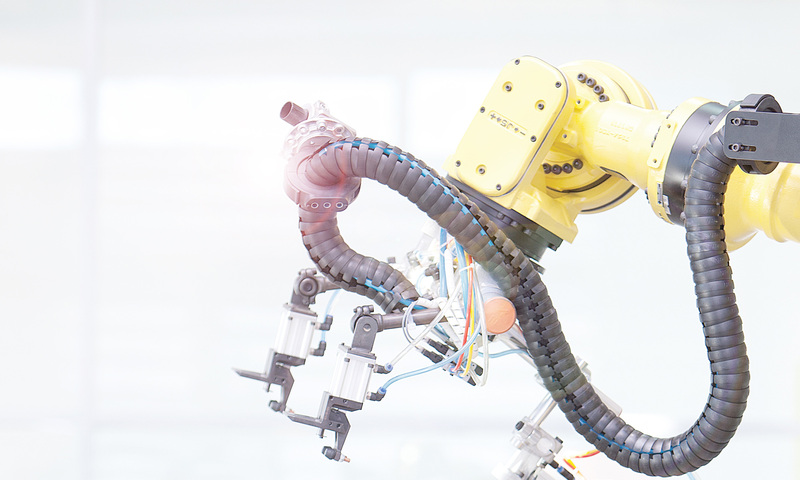 Again to the left and near center, just under the end of the aluminum extrusion is a color sensor, validating the yellow safety header on the jack’s label. In the rear side of the extrusion is an inductive proximity sensor, M18 in size, validating the presence of a lock clip, used to support the two ends of the jack’s screw handle. Finding this feature confirms that both pieces of the jack’s primary crank handle is present, a most vital part of the kit. Extreme right and rear of the kit is a blue M18 capacitive sensor confirming the presence and proper alignment of the polyurethane jack kit mold that all of the components fit into (if it’s not aligned properly, the presence of other components might be missed). Extreme left and rear of the kit is another blue M18 capacitive sensor confirming the presence and proper alignment of the polyurethane on the left side. Extreme left and over the kit is an M18 tubular photoelectric, diffuse reflective sensor detecting the presence and proper seating of an accessory in the kit. Same sensor location is a second M18 diffuse reflective tubular photoelectric sensor with BGS (background suppression) confirming the presence of the yellow Glyptol coating on the accessory handle. Vision sensing was being considered for detecting proper languages on the safety labels. Next PostNext What’s an Artificial Lift?